This is a quite well-known Vietnamese restaurant in Hanoi which is especially popular with visiting Vietnamese and other Asian tourists. It has a good range of dishes and drinks but the price is a bit over the top and the service's not the best. Located right next to the Hoan Kiem Lake, the heart of Hanoi, it has wonderful views over the lake to Ngoc Son temple. 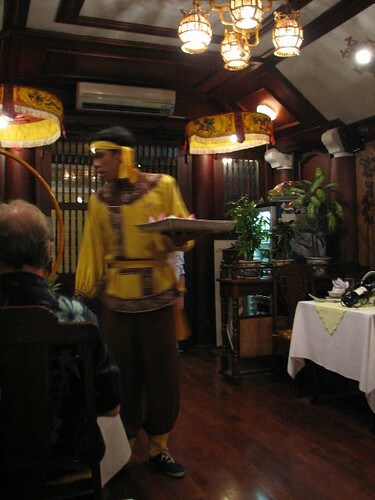 There are lots of tour groups coming to this place because of its location, the presentation of the food and the traditional music. 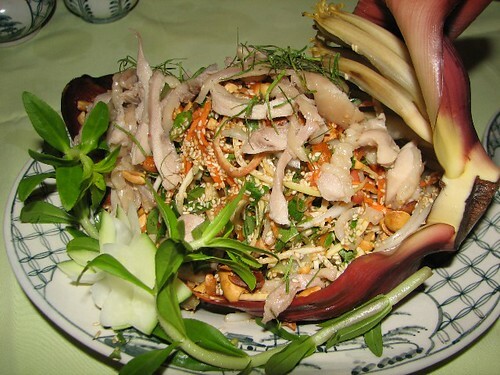 The food highlights when I was there were the pork in clay pot and the banana flower salad (pictured above). Signs and rules in Viet Nam are meant to be broken. Look at the above picture. It says that proper attire is required, no shorts or T-shirts. It's hilarious, isn't it? Buses are one of the most common forms of transportation in Viet Nam. In cities like Ha Noi and Ho Chi Minh City the traffic situation is crazy everyday, with not only buses but also lots of cars and millions of motorbikes. I remembered I caught a bus once a few years ago after a long trip from Bai Tu Long Bay. I took a bus home and it was really uncomfotable, smelly and full of people. But it has changed so much in that short time, especially the city buses in Hanoi. With thousands of people travelling by bus daily, bus companies are spending lots of money for new buses but it's still not enough. The buses are commonly over-crowded, with about 50 people in a 30 seat bus, which is not right and could be dangerous. For only 5000Vnd, you can go from one side of the city to another, even from the city center to the airport which is really good. Because of the cheapness and convenience, so many people use this service. The new buses are clean and nice but the service from the drivers and the staff are not really nice due to the work conditions. They have to work from 14 hours to 16 hours a day without heath insurance, full of stress about being on time, and crazy traffic always around them on the roads. All these stresses add up to make these drivers and the staff get angry easily and this can lead to accidents. In Hanoi, all of the disabled get free bus trips all over the city, which is really good news for those who want to travel by bus instead of motorbike taxi or walk. Travel by bus is also risky not only because of the way they drive, but because there some thieves waiting for your unsuspecting moment, your wallets, mobile phones, money or whatever they think they can exchange for cash.